For small businesses, there's a silver lining to the current recession: large companies are in retreat mode, cutting their marketing budgets in order to appease shareholders (also here). This creates a great opportunity to outmaneuver the behemoths and gain market share. The better news: you don't have to spend a lot to be an effective marketer. Our recent report, "The State of Inbound Marketing," revealed that inbound marketing is more cost effective than outbound marketing. Small businesses are taking notice (and they should, since 78% of those surveyed estimated that they spent $25,000 or less on marketing last year). In the report, small businesses professionals (defined here as 10 employees or less) gave some great insight into how these organizations are transforming their marketing efforts to drive more leads at a lower cost. Blogs and search engine optimization were most frequently cited as a 'lead channel' of growing importance, as small businesses leverage these tools to allow customers to more easily find them on the Web. In fact, blogs and SEO were the only two categories to break the 50 percent threshold for this question. Email marketing came in third, but we emphasize that businesses need to do it the right way by following best practices. 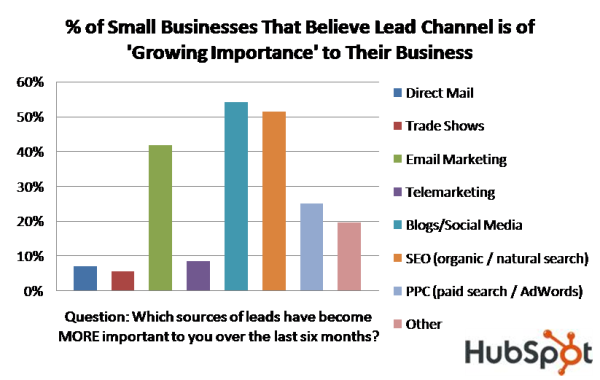 Not only are small businesses saying inbound marketing is important, they are putting their money where their mouth is. 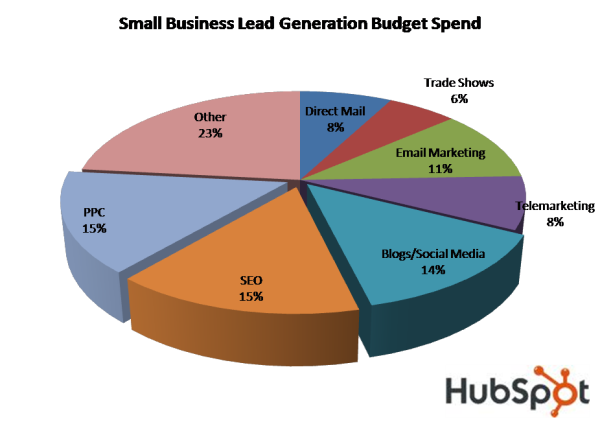 Small businesses spend about 44% of their lead generation budget on either blogs/social media, SEO or PPC. In contrast, larger businesses (with 50 employees or more) spend 32% of their budget on inbound activities. 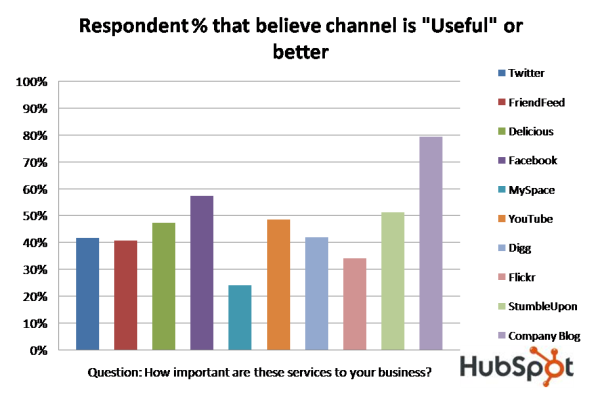 Respondents from these organizations reported spending a greater amount on trade show and telemarketing activities. Within social media, small businesses are putting the greatest emphasis on blogs. Blogs are a great place to start, but it's also important to establish yourself in emerging forms of social media marketing before your competitors do. Also of note, it's interesting to see that MySpace finished dead last in this ranking. It's well documented that MySpace has a less-than-stellar reputation for businesses, but to see it further down the list than photo-site Flickr and considerably smaller FriendFeed indicates just how poor that reputation is amongst small businesses. Learn more about inbound marketing and how to combine blogging, SEO and social media for results. Download our inbound marketing kit.